When it comes to energy efficiency, Odawa Casino is not a new player. The 300,000 ft2 casino, hotel & venue has their eye on the jackpot 24/7. The beauty of this resort isn’t only in the architectural features and well designed interior spaces, it’s behind the scenes as well, better known as ‘back of the house’. Odawa first created an Energy Reduction Committee in 2009 to collaborate their ideas and goals into working actions. “It takes a team”, said Dave Heinz, lead electrician at Odawa Casino. The team believes a strong collaborative effort will achieve their aspirations of a greener Michigan. Although the quest to reduce energy at Odawa was always internal and focused on running a top notch establishment. As of late, Odawa is getting plenty of external attention as well. 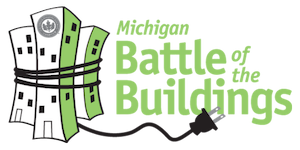 In 2014 the resort joined the inaugural Michigan Battle of the Buildings ‘biggest loser’ styled energy competition and took home the 2nd place trophy in the entertainment buildings category. The team was able to reduce energy a whopping 5% and that’s something to write home about. The gaming industry requires a large amount of energy to keep their doors open and Odawa is no exception. Heinz said, “Odawa’s reduction translates to approximately 1.4 million kw hours of electricity and 36,182 MMBTU of natural gas per year.” This is equivalent to removing 501 passenger vehicles from the roads each year. Once again we find Odawa on the leaderboard for their efforts, a finalist for a Governor’s Energy Excellence Award in the Best Commercial Project category. The Governor’s Energy Excellence Awards honors Michigan organizations and individuals for their commitment to responsible energy production and consumption. Odawa was nominated by Great Lakes Energy for 10 projects they completed in 2015. Changing kitchen operations lead to reduction in gas and electric by approximately $15,000 per year. The team at Odawa continues to compete in the Michigan Battle of the Buildings each year and Heinz volunteers his time to tell the Odawa story. If you have the opportunity to hear him speak – do it – you won’t be disappointed. Heinz is proud of the Odawa Resort accomplishments and eager to share the victories (and disappointments) in a way that only he can. Congratulations to the Odawa team! Being a finalist for the Governor’s Energy Excellence Award is a victory in itself. But, since we know you will be holding your breath until August 11, 2016 when the winners are announced at the Wharton Center for Performing Arts, just know that we will be holding our breath alongside you.